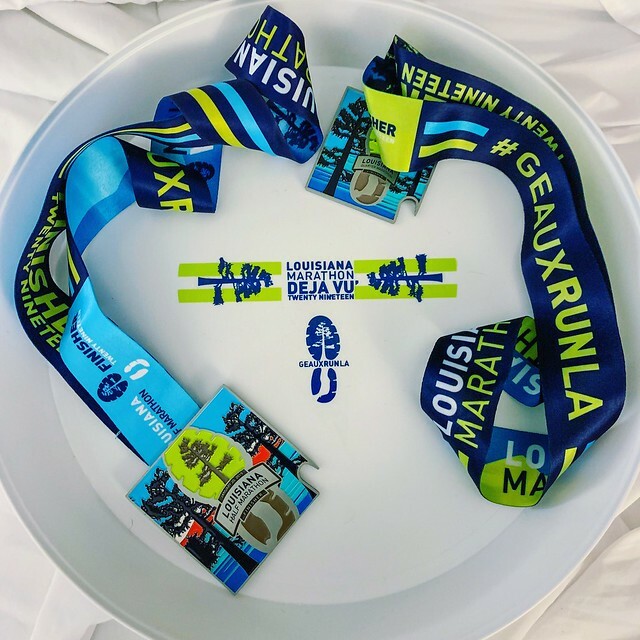 Louisiana Marathon weekend happened a couple of weeks ago, but I never got around to talking about the events of the weekend. 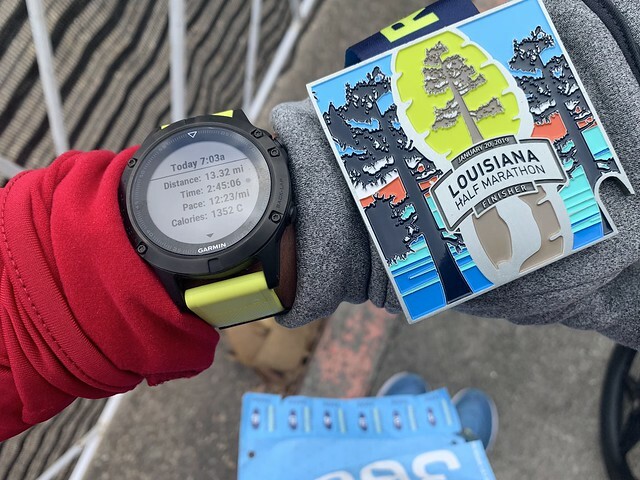 The event happened January 18-20, 2019 in Baton Rouge. The event didn’t go exactly as planned, but the weekend turned out great. This is the race weekend I look forward to every year. The atmosphere is great! The expo isn’t my favorite part because it’s very small. There isn’t really much to see or do so it’s really just a place to pick up your bib and see friends. There were a few extra things this year but I missed some of the old vendors this year. 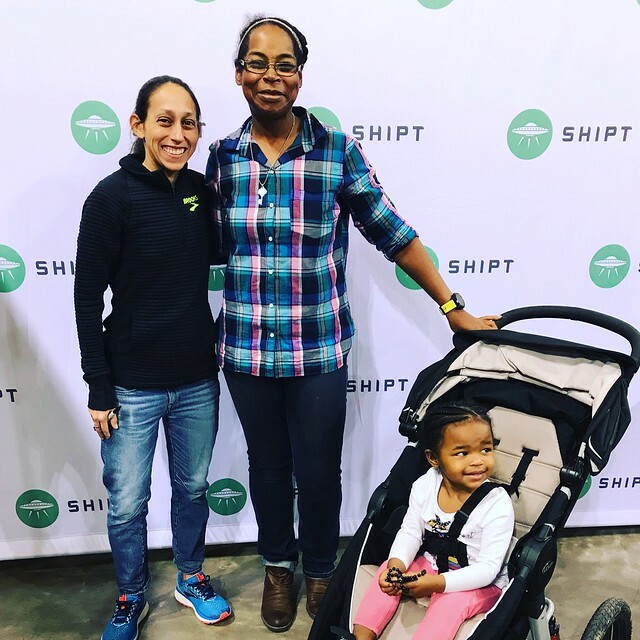 The biggest addition was Des Linden being at the expo thanks to Shipt. I don’t get many opportunities to meet elite athletes in such an intimate setting. This is one reason I am glad this race isn’t so large. The plan for the weekend was two days of racing: the quarter marathon on Saturday and then a half marathon on Sunday. Unfortunately, a cold front moved through the city and dumped a crapload of rain for 3 hours on Saturday, which just happened to be during the first day events. This was really disappointing but it was the right decision to cancel the races for safety. Luckily, the weather cleared up in time for the kid’s race and I got to run my best friends son. He likes running which makes me so happy. He did so well! It took us 11 minutes and 23 seconds to run the kids mile. He definitely earned his medal. 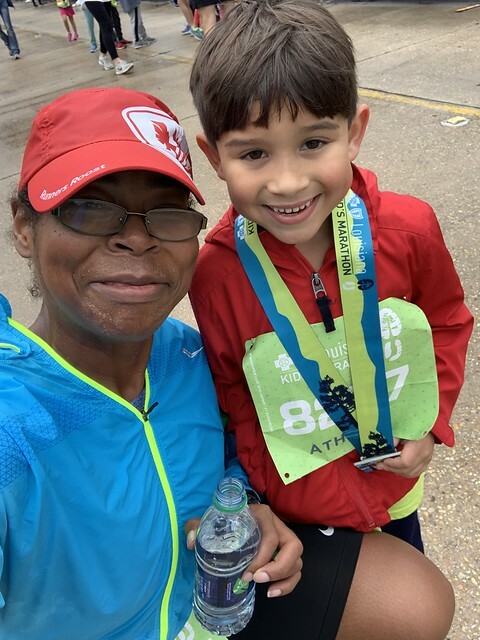 It was still important for me to get out to run my miles because A. it was on my training plan and B. they were giving out the medals and I wanted to earn my medal. I ran on the treadmill during the time the race was canceled. I only did 3 miles because the treadmill wasn’t awesome. 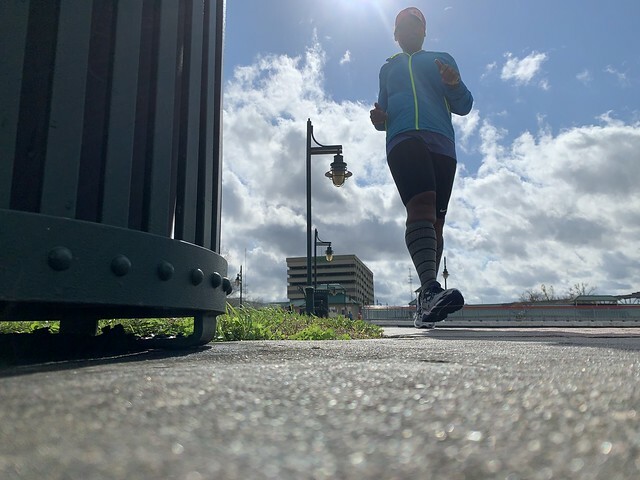 Then I ran the kid’s mile and then I finished it up on the Baton Rouge levee. I don’t have any pictures, but we went to lunch at the food truck festival which has now become part of the running weekend. It’s nice to have so many food trucks to show all the different Louisiana cuisines. We enjoyed crawfish poutine and crawfish and grits. Sorry, I was a bad blogger and didn’t take any pictures. The next morning was the day of the half marathon. Remember that cold front I told you about? It came through in full force and it was 30-something degrees. Everyone just wanted to keep moving. 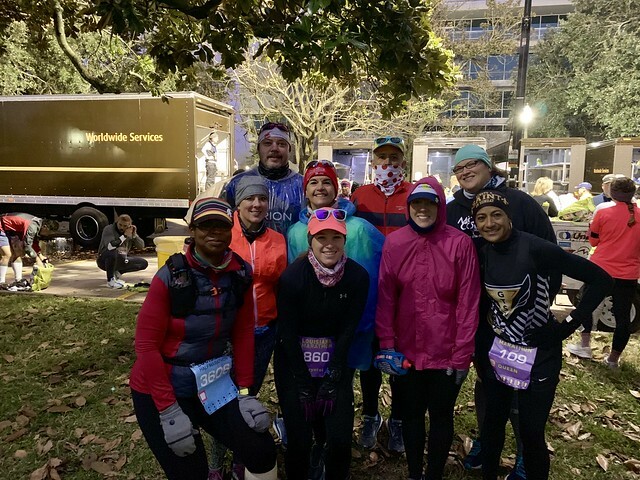 There was a great group of people from home running the race which is so great. I’ve run this race for 7 or 8 years, I lost count, so it nice to see other running friends coming through. The race went well for me. I’ve been trying to break into the 2 hours and 40-minute range on my half marathon for a long time. My journey after the baby hasn’t been easy but that just makes me appreciate it so much more. I have to throw all my old times out of the window and focus on the now. This was the fastest half marathon I’ve run since coming back. It was also great seeing friends on the course who take awesome pictures of you. This is one of my favorite pictures from the weekend. It was super cold which was probably the most ideal for me. Last year at this race, I tore my hip flexor and couldn’t run for a couple of months so I was super cautious about falling and tripping. I had a great time running the course and talking to people. I can honestly say I had a great time the entire time on the course which I attribute to running a good time. I wasn’t focused on time or pace. I ran this race on feel and just smiled and laughed. This is the type of running I want more of in my life. There were a couple of hiccups at the weekend but it was still fun. 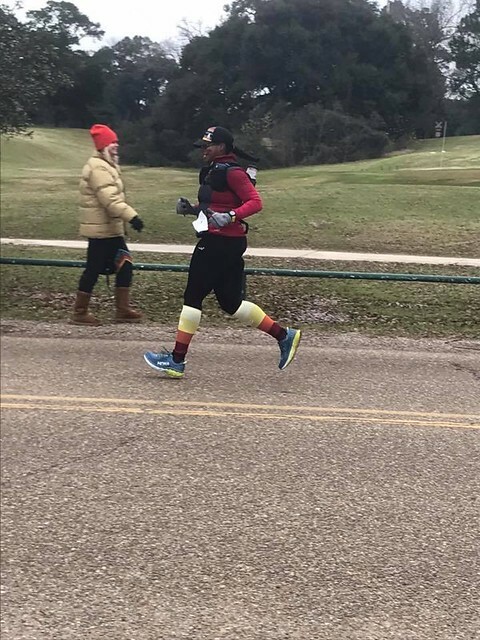 I didn’t stay around the finishers festival because it was just too cold. The wind was blowing and it was just too much for me. I really hate that because I enjoy being able to drink all the free beer and eat all the jambalaya. It just wasn’t in the cards for me this year. I wish I had more visuals for you but I couldn’t even operate my phone at the end because it was so cold. 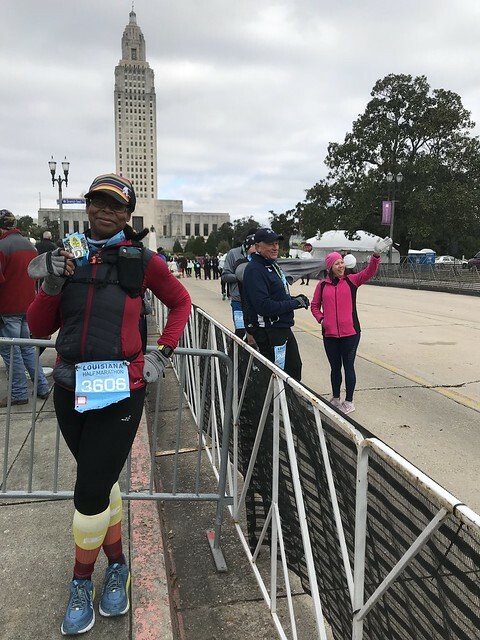 If you have to opportunity to run The Louisiana Marathon weekend races, you should. There is a race for everyone. Saturday is for the kid’s race, 5k, and quarter marathon. On Sunday, it’s time to shine in the marathon or half marathon. It’s a great inclusive weekend for the family. You won’t regret taking part in the weekend. I’m already thinking about next year!